Every rock on Earth contains a clock, a thermometer, and a barometer. Inside all rocks are elements, or isotopes of elements, called “natural tracers.” By examining the presence, proportion, and distribution of natural tracers within rocks, we can reveal the conditions under which the rocks formed. They can tell us when the rocks formed (clocks), how fast they cooled, and how they crystallized (thermometers), and the temperatures and pressures they experienced at their creation (barometers). Just as radioactive tracers are used to understand the dynamics of chemical reactions, natural tracers in rocks can be used to help decipher the whens, wheres, and hows of the complex geological processes that create and maintain our planet. With the right tools, we can extract long-dormant, hidden information about Earth’s inner workings from rocks. The Ion Microprobe Facility at Woods Hole Oceanographic Institution is just such a tool. With it, we can peer far back in time and deep into the earth. To understand processes that form new oceanic crust, for example, we have used the WHOI ion microprobe to study ancient rocks from the crust and underlying mantle, which have been thrust up and exposed on land (in formations known as ophiolite massifs). And we have compared those with rocks from active mid-ocean ridges on the seafloor. The ion microprobe offers great advantages over previous methods to glean natural tracer information out of rocks. Before, scientists had to break apart sample rocks and extract minerals containing specific tracers. The purified minerals were then chemically processed, and the amounts or types of tracers were determined using various instruments. It is a painstaking and time-consuming process, and something important is destroyed in the process of mineral extraction and purification: the textural relationships in which mineral crystals occur in the rock. Rock texture is significant because it reflects the dynamic conditions under which minerals crystallized, and it presents a geologic framework within which to interpret the tracer information. For example, if a rock forms while conditions around it are changing, the minerals in the rock will show different textures or grain sizes depending on the conditions. This information is lost in traditional processing, but retained with ion microprobe analysis because the rock is not broken up. With the ion microprobe, we can look at the composition of very small samples and identify components in situ, even over distances only micrometers apart. The first tools that allowed analysis of a sample’s composition without chemically processing it were earlier electron-beam microprobes. These machines generate electron beams, focus, and direct them at a rock sample. The electrons hitting a sample cause the production of x-rays, and measuring the x-ray spectra allows us to determine the chemical composition of the samples. In contrast, ion microprobes use focused beams of ions (charged atoms), to bombard a sample. Ions are much heavier than electrons, and the ion beam causes the sample to eject atoms and ions, rather than just emit x-rays. When the ion beam strikes the sample, atoms and ions are “sputtered” (sprayed out) from the sample. The ion microprobe has two basic parts: the ion-beam source, which focuses and directs microbeams of ions onto the sample, and the mass spectrometer, which measures the signal intensities (abundances) of ions ejected from the sample. Sputtered ions are accelerated into the mass spectrometer, where the ions are detected and distinguished based on their different masses and charges. From the intensities of ions of different elements, we can determine the chemical composition of the sample. From the intensities of isotopes of specific elements, we can identify the isotopic composition of the elements. The ion microprobe adds new dimensions to our analyses for two reasons. It can detect tracer elements with much greater sensitivity. It also gives us the ability to determine both the chemical composition (the elements present) and the isotopic composition (the proportions of different isotopes of the elements) of minute amounts of tracers, in small samples, without breaking the textural context in the rock. How do rocks melt and migrate beneath the seafloor? The WHOI ion microprobe is helping researchers shed light on a fundamental, but still largely unknown process that shapes our planet—how rock deep beneath mid-ocean ridges melts to form magmas, and how the melted rock then migrates toward Earth’s surface at the ridges. The instrument has provided the first unequivocal evidence that a type of melting called “near-fractional melting” is occurring deep beneath ridges. In near-fractional melting, solid and melted rock do not stay together. The melt finds pathways and immediately escapes the not-yet-melted rock. We deduced the occurrence of this type of melting by examining compositions of the solid rocks found at mid-ocean ridges. The work is based on our knowledge that when rocks melt, elements are distributed between solid and liquid phases in a particular way. Evidence for near-fractional melting was first found by determining abundance patterns of particular trace elements (the rare earths, or lanthanides) found in a mineral (diopside), which is itself present in very small amounts in rocks (peridotites) dredged from ocean ridge fracture zones. Researchers could not have analyzed such small quantities with conventional geochemical techniques, but the ion microprobe enabled researchers to determine lanthanide abundance patterns in samples, and demonstrate this type of melting. The same melting has now also been identified in mid-ocean ridge basalt, in tiny glass particles, or glass (melt) inclusions, incorporated into crystals of olivine, a mineral that forms in basalts as they cool and solidify (above right). By determining the isotopic composition of an element, lead, in melt inclusions, we are changing our views about the mantle source for mid-ocean ridge basalt, and about how magma migrates from the mantle to the ocean floor. We know that melt inclusions are entrapped in olivine at shallower, less-pressurized levels beneath the seafloor. 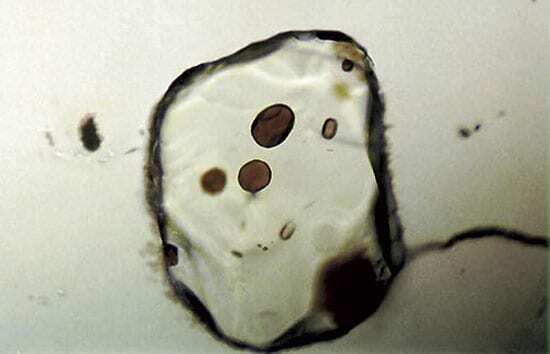 But the variability of lead isotopes that we are observing in melt inclusions in seafloor rocks samples indicates that melts from different mantle sources are rising separately and are not mixing before they reach the level at which olivine forms. We can study more than rocks with the ion microprobe. WHOI researchers Anne Cohen and Graham Layne have used the facility to examine the hard calcium carbonate skeleton in corals, which can reveal a record of hurricanes and past sea surface temperatures. 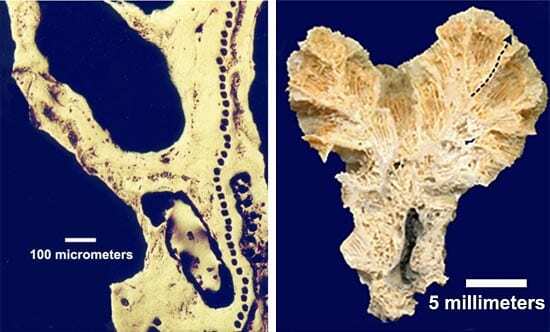 They sample areas small enough to see layers of skeleton produced by the coral in a day or less. For the hurricane studies, they use the ion microprobe to determine the ratio of two stable isotopes of oxygen in the carbonate. A higher percentage of the lighter oxygen isotope is incorporated into coral skeletons during periods of very heavy rainfall, which occur during hurricanes. Ancient or fossil corals thereby can reveal a record of hurricane events and patterns stretching into the past. To estimate past seawater temperatures, researchers often use strontium/calcium ratios in coral skeletons (the higher the strontium, the lower the temperatures). But Cohen used the ion microprobe to reveal a subtle wrinkle in the relationship between the element ratios and water temperatures. Cohen studied corals living in Woods Hole harbor (Astrangia poculata), some of which have algal cells living symbiotically in their tissue, and some of which lack the algae. The photosynthesizing algae produce sugars that the corals use for energy. That increases the coral’s ability to deposit hard skeleton material and build large coral reefs. Cohen showed for the first time that at different seawater temperatures, the algae function differently, and as a result, different amounts of strontium and calcium are incorporated into coral skeletons. Thus, the strontium/calcium ratio can be used to determine past water temperatures only in skeletal material produced by algae-free coral, or in the absence of sunlight. 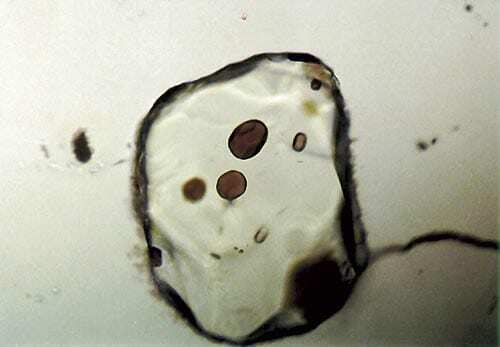 Tiny glass inclusions, about 50 micrometers in diameter, are enclosed in olivine crystals from mid-ocean ridge basalt. The amounts and distribution of isotopes of lead within the inclusions yields information about the mantle source of the basalt. (left) Black line of spots in the photo above show the path where the ion beam harvested ion samples from the coral for analysis. (right) Dotted line in photo above indicates where a thin, 5-millimeter cross section of coral was removed and placed in the WHOI ion microprobe.